The fuzz on the leaves of the nankin cherry glows brilliantly when illuminated from the rear. 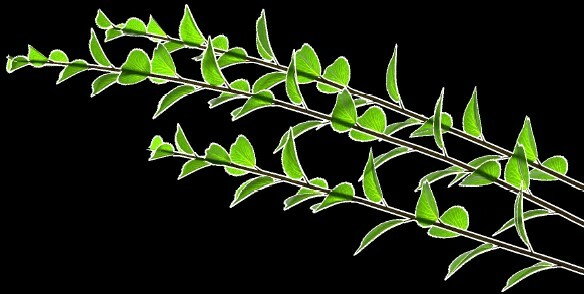 The appearance of computer generated plants has improved significantly due to recent advances in both modeling and rendering. In this paper we describe a system that further improves the appearance of CG plants by including the tiny hairs that cover many plant organs. A plant skeleton is generated using an L-system and graphically interpreted using generalized cylinders. The individual hairs are then mapped onto the surfaces and boundary edges of the mesh. Hair properties are specified and adjusted according to positional information. Sample images included in the paper illustrate the impact of hairs on the appearance of rendered plants. Modeling Hairy Plants. In Proceedings of Pacific Graphics 2004, pp. 217-226.